In this article I review the science and method for how LDN works. I describe how to use it in Lyme disease. And I review potential side effects. Naltrexone is an opioid receptor blocker. Narcotics, like oxycodone found in Percocet and hydrocodone found in Vicodin, are opioids. When they bind to an opioid receptor, narcotics regulate pain. Humans make natural narcotics called endorphins. These endorphins regulate pain and the immune system. Low dose naltrexone (LDN) is "low" because it is used at much lower doses than physicians use to treat people with narcotic addictions (or overdose) and alcoholism. It is manufactured only as a 50 mg pill. When it is used to regulate the immune system, it is dosed at 1.5 to 4.5 mg a day. Compounding pharmacies that make medicines in house are able to produce naltrexone in low doses by crushing the 50 mg pill and dividing it into to "low" dose 1.5 to 4.5 mg pills. How Does LDN in Lyme Disease Work? This video was recorded when in July, 2018 when Dr. Ross practiced in Seattle, Washington. At low doses LDN attaches to opioid receptors on temporary basis of around four hours. Sensing the blockade, the body produces more endorphins and more endorphin receptors. The existing endorphin receptors also become more sensitive to endorphins. The increased rebound endorphins help with pain. But they also decrease immune system hyperactivity. This is the type of immune overactivity where the immune system attacks a person’s tissues leading to ongoing inflammation like in Rheumatoid Arthritis. It is also the type of activity where chronic infections trigger an overproduction of inflammation cytokines. These cytokines are the cause of most Lyme disease symptoms. See Control Cytokines: A Guide to Fix Lyme Symptoms and the Immune System for more information. For instance, studies show LDN leads to decreased white blood cell production of T and B cells which are involved in fighting infections. Also cytokines decrease, on LDN, as the immune system shifts away from a TH1 inflammation pattern to more of a TH2 inflammation pattern. TH1 inflammation occurs when white blood cells that fight infections, like T cells, become too turned on. TH2 inflammation is more commonly seen in allergic type reactions. It is also inflammation triggered by antibodies attached to germs. TH1 and TH2 inflammation are regulated by Treg white blood cells. These Tregs work better at creating a balance between TH1 and TH2 when someone is on LDN. White blood cells use Toll-like receptors to recognize germs like bacteria and viruses. A type of white blood cell in the brain is a microglia. If its Toll-like receptors are turned on too much, and ongoing, it can lead to neuropathic (nerve) pain. This could explain some of the pain felt throughout the whole body in people with Multiple Sclerosis, for instance, or in Lyme disease. The turning on of Toll-like receptors is one idea why people with Fibromyalgia have ongoing pain throughout the body. Toll-like receptors are also on Mast Cells. Some with Lyme develop Mast Cell Activation Syndrome (MCAS) leading to ongoing health problems. See Mast Cell Activation Syndrome & Lyme for more information. LDN binds directly to the Toll-like receptors. When it is bound to the receptors, bacteria and other stimulators of these receptors are blocked. LDN does not activate the receptors, but provides an effective blockade. So LDN in Lyme disease can help nerve pain, fibromyalgia like pain, and even regulate mast cells in MCAS. 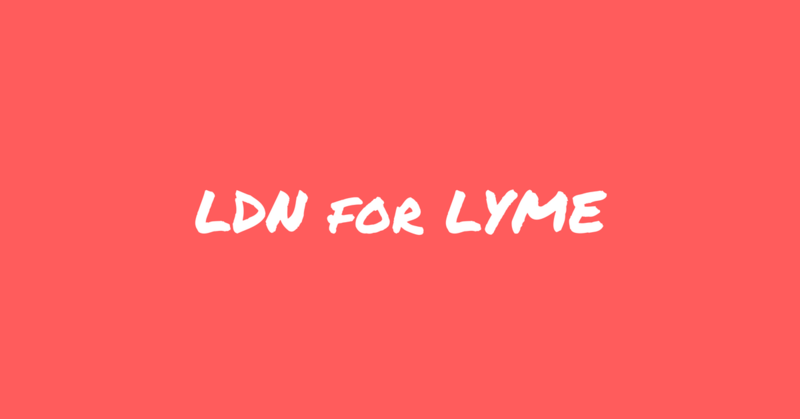 There are three ways LDN in Lyme disease helps pain. One reason LDN may help pain, is that the increased endorphins bind to a greater number of endorphin receptors which are more sensitive. In other words, a person's natural narcotics work better. LDN blocks Toll-like receptors to regulate nerve generated pain, which includes fibromyalgia type pain. There is limited science showing LDN helps in fibromyalgia, multiple sclerosis, and Crohn's disease. There are many more conditions which it seems to help based on case reports and discussions with healthcare providers. For more detalied information about conditions treated and the reasons why LDN works read The LDN Book published by the LDN Research Trust. The LDN Research Trust is building a scientific basis for LDN and promoting its health saving benefits for a variety of conditions. Unfortunately, no one has done research to see if LDN helps in Lyme disease. I found helpful in my Seattle practice in true auto-immune illnesses like rheumatoid arthritis, Hashimoto's thyroiditis, ulcerative colitis, Lupus, and others. I also saw it help in multiple sclerosis. At one time, I did not see much benefit in using LDN for most with Lyme. But I have changed my opinion. I use to have people try it for 3 months. If a person did not see improvements, I would have them stop. I now realize, this medication takes time to work. When I used it in patients for 6 months or more, I found benefits for many people with Lyme. There are three situations to use LDN in a Lyme disease treatment. Use it at the beginning of treatment when someone has another autoimmune illness like Lupus or Rheumatoid Arthritis. If a person is 6-9 months into treatment following the full Ross Lyme Support Protocol, and her or his improvements are small, try LDN. If a person has completed Lyme disease antibiotics, but many symptoms remain,try LDN. For some, chronic Lyme infection triggers an autoimmune illness that LDN can regulate. And in some, Lyme triggers an ongoing cycle of cytokine inflammation that LDN can break. Start at 1.5 mg a day for two weeks, then at 3.0 mg for 2 weeks, and finally at 4.5 mg a day on an ongoing basis. Because it can cause insomnia in some, take it in the morning. If a person has a lot of side effects or gets worse with her or his symptoms initially, then decrease the dose to half of the above. Often the side effects will go away by lowering the dose. Common neurologic side effects include: anxiety (15.7%), drowsiness (11.6%), headache (11.6%), insomnia (8.3%), muscle pain (8.3%), vivid dreams (5%), mood change (3.3%), and trouble with concentration (1.7%). Ploesser J, Weinstock LB, Thomas E. Low Dose Naltrexone: Side effects and efficacy in gastrointestinal disorders. Internat J Pharm Counound. 2010: 171-173. Elsegood L. The LDN Book. White River Junction, Vermont: Chelsea Green. 2016. Weinstock L, Cottel J. Low Dose Naltrexone and Autoimmune Disease Therapy. Presentation presented at the: 2018; Institute for Functional Medicine Annual International Conference, Hollywood FL.